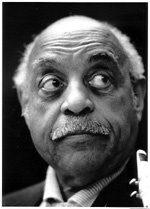 Saxophonist Benny Carter, photographed when he was Artist-in Residence at Harvard University, Cambridge, MA in 1988. Benny Was a link between the swing and bebop eras of jazz. A prolific composer and teacher, revered by all.